Masha’Allah, the Muslim Girl Scout Troop has been busy finishing off the year with many accomplishments. The Daisies, Brownies, Juniors and Cadettes have completed different “Journeys” and earned many skill badges this year. It will definitely be a year for the girls to remember, having gained great friends, made amazing crafts, and experienced new things. This year, our troop will be completing three (3) different service projects. The Girl Scouts donated purses, backpacks, personal hygiene items, along with baby supplies and crafts for kids to go to a Syrian Refugee Camp in Jordan. Masha’Allah, we had over 90 reusable bags/purses/backpacks donated that we filled with supplies for the women and kids there. Another service project we completed was making dog chew toys and cat scratchers using recyclable materials to donate to the Humane Society of Tampa Bay. The last service project of the year will be to make Chemo Care Kits for Cancer patients at a local hospital. Masha’Allah, the girls decided to do this project with the profit/donations they earned while manning cookie booths during Girl Scout Cookie Season. The girls have been learning how to make some cool crafts as well. The Brownies and Juniors had an appreciation lesson for moms that included hadith and nasheed sung by the girls for the mothers. The girls made homemade hand scrubs for their mothers using all natural ingredients. The Cadettes have been learning how to hand sew, crochet and make decorative knots. The Juniors learned how to weave pot holders. The Daisies made an animal journal as they completed their Animal Journey. The entire troop participated in a Recycled Runway Fashion Show. The girls worked together in teams to design and dress a Daisy member in recycled materials. They all had a blast! We only have a couple of meetings left until we conclude the activities for the year. Insha’Allah, in August, we will be opening up registration so that more girls can join our troop. However, we need females that are willing to volunteer to be a troop leader or assistant troop leader. Please email girlscoutsmom01@gmail.com if you are interested in becoming a troop leader. Rajab (Arabic: رجب‎) is the seventh month of the Islamic Calendar. The lexical definition of Rajaba is "to respect", of which Rajab is a derivative. This month is regarded as one of the four sacred months in Islam in which battles are prohibited. The pre-Islamic Arabs also considered warfare blasphemous during the four months. "O Allah, make the months of Rajab and Sha'ban blessed for us, and let us reach the month of Ramadan (i.e. prolong our life up to Ramadan, so that we may benefit from its merits and blessings)." On Sunday, April 10, the Islamic Society of New Tampa hosted a free legal clinic offered by CAIR Florida (CAIR-FL). At the clinic, CAIR-FL’s legal team gave a basic overview of the services the civil rights organizations offers while addressing the specific needs and interests of attendees. According to CAIR-FL Civil Rights Director Thania Clevenger, bullying and discrimination in schools is one of the largest issues facing Florida’s Muslim-American community today. Unfortunately, though, students and families are not doing enough to report such incidents, making it more difficult for the organization to work to remedy the systemic problem. While CAIR-FL is working proactively to educate schools in the state on the needs of Muslim students, Clevenger stressed the importance of the Muslim community making CAIR-FL aware of bullying incidents so that the organization can have a more holistic understanding of the situation. Civil Rights Staff Attorney Katherine Heffner discussed the issues of employment discrimination and requesting religious accommodations in the workplace. Her presentation was beneficial not only to employees who may not have been aware of the proper steps to take to address workplace discrimination, but also to small business owners in the community who need to ensure they don’t run afoul of the law. The relatively small audience size allowed for a roundtable discussion between CAIR-FL staff and members of the community. Several attendees had questions about travel issues. After explaining what an individual’s rights are and are not when travelling into and within the United States, Clevenger asked community members to report any travel difficulties they have to CAIR-FL so that the legal team can file complaints with the appropriate federal agencies. Majda Rahmanovic, events and outreach director, and Maryam Saleh, immigration legal assistant, also offered a few words of advice to Muslim women who may feel uncomfortable when passing through airport security. For example, they mentioned that Muslim women have the right to request that a pat down be conducted by a female officer or in a private room. During the last segment of the legal clinic, Immigration Attorney Floyd Huntz gave an overview of the immigration services that CAIR-FL offers. He also explained some of the challenges within the American immigration system, such as extreme delays in processing asylum and other applications. Huntz was proud to share that one of CAIR-FL’s clients recently became a naturalized U.S. citizen after a twelve-year delay and in response to a federal lawsuit the organization filed on his behalf. Overall, the audience appeared to have benefited from the clinic. In fact, several community members followed up with CAIR-FL staff in private conversations to discuss specific issues they face. Rabia bano was born in Pakistan currently lives in Tampa. She respects her mom the most. She got a Bachelor's degree from college. She is proud to have a great blessing from Allah: her daughter and her sons who are always ready to help. She used to be a teacher; now she caters food. She helps her community by catering food. She advises young people to be better Muslims and make non-Muslims proud of Muslims. Mariam Fatima was born on January 11, 1998 in San Jose, California. The 18-year-old girl has moved twice, from San Jose, California to Dallas, Texas, and from Dallas to Tampa, Florida. Currently residing in Tampa, Ms. Fatima attends the University of South Florida, where she is majoring in Biomedical Sciences and Public Health. She is most proud of two things: starting and being president of the ISONET Youth Group and seeing it develop to what it has today. Eman Al-Mafarjah is from Amman, Jordan and currently lives in Tampa, FL with 3 children. Her favorite childhood memory was playing. She became a hairstylist for ladies. The lady that she respects the most is her mother. Her favorite school memory is graduating. Two things she is proud of are practicing her religion and the way she raised her children. She advises children to work hard and to follow their dreams! Asmaa beso was born in on April 21, 1978 in Damascus, Syria. She helps poor people in her community by giving them essentials like food, water and clothes. She also gives money to orphans in Syria. She currently lives in Tampa and spends her free time exercising and going to the gym. Shelooks up to her mom and her teacher. Asmaa Beso’s favorite school memory is when she went with her friends on a field trip. RaJade M. Berry-James - Born in Neptune, New Jersey in 1965. 1. What is your career, and why did you decide upon it? I am a tenured faculty member in the field of Public Administration. My current rank is associate professor, and I am a research fellow in the Center of Genetic Engineering and Society. As a research fellow, I am interested in cultural attitudes toward genetic foods. I always knew that I wanted to teach for a living. The professoriate is a rewarding profession since you get to mentor students and learn new things. 2. What would you think it would be like if women didn’t have the rights they have today? I can’t imagine a world where women’s rights were not a part of the landscape for equal rights. Every man has a mother. Every man should want for his mother a world where her rights are as important as his rights. In my work, I advocate for equal rights for all. 3. What is your favorite school memory? My favorite school memory was joining a sorority as a freshman in college. My sorority, Alpha Kappa Alpha Sorority Incorporated, is a service-oriented sorority. We were engaged in community service, sisterhood and helping to uplift the lives of others. Being in my sorority helped me to finish school and maintain professional ties with other women who care about young girls and the communities that they live in. 4. What are two things that you have done that make you feel proud? I am the first person in my family to complete college and the first black PhD in Public Administration from Rutgers, the State University (Newark). After I graduated from Rutgers, some of my nephews and cousins talked about becoming doctors and lawyers. I think my academic success had a positive impact on their ability to dream beyond their life’s circumstances. 5. Which women do you respect and look up to? My grandmother, Mary L. Berry, worked for the State of New Jersey as a psychiatric nurse for more than 40 years. Her public service career had a huge impact on my own career. I learned about public service values through her sacrifice for work that improved the lives of others. Among all, I compare them to her. 6. What advice would you give to young people today? Find a mantra that you can adopt to guide all that you do. My personal mantra is, “S/he who learns, teaches.” I know that everything that I learn helps me to become a better teacher to my students, my friends and my family. Use your mantra to help achieve your dreams. 7. What is your role in your community, and does it help your community? At work, I engage in community service to help the most vulnerable in the community. For the past 5 years, I have worked with the homeless of Raleigh. I serve on the Board of the Raleigh-Wake Partnership to End and Prevent Homelessness. As a teacher, I use service learning opportunities in the classroom so that my students can work on board initiatives. As a mother, I have my daughters serve the homeless community. Community service is central to my life and important to me. of myself that no one can see but You. dance for. What they survive for. didn’t fashion it. Who didn’t really know me like You. and expecting it to find patterns and lines and color schemes fascinating. and ventricle and beat. It’s not strange to You. Sometimes I can’t see or feel love. Because I forget the only love my heart really knows. And it’s with You. It has always been with You. On Sunday, February 21, people of all faiths and walks of life were welcomed to ISONET’s 2nd Annual Open House. More than 400 guests visited the masjid on this bright and sunny day, where they took a tour inside the prayer hall, lined with rows of beautiful posters detailing the basics of Islam. Many community members decided to pay our masjid a visit because they wanted to confirm their notion of Islam being a peaceful religion. Others were curious to experience something they had never been exposed to before. Regardless of their motivations for attending, many visitors expressed their comfort in learning that Islam as portrayed by the media is quite contrary to what Muslims actually believe and carry out. Other guests said the Open House changed their perspective on gender roles. Mr. and Mrs. Hooper said they were pleased to find out that there was no actual ban in Islam on women driving. They developed a better understanding of how important women are in Islam, and came to the conclusion that religion and the countries that show that they enforce it sometimes do not follow the proper Islamic rulings. “We’d look foreign if we entered a Middle Eastern country; it’s all about perspective,” said Regina Hooper. The local community also overwhelmingly supported the masjid in preparing for the event. Volunteers from the Tampa Fire Department on Cross Creek Boulevard attended the Open House and brought with them two fire engines for children to see. Members of the Cypress Point Community Church, which is next door to the masjid, attended and expressed a genuine interest in building bridges with our community. The tour of the masjid was concluded with a generous lunch, prepared and served by committed members of the community. Most attendees said they learned about the Open House from advertisements in both the Wesley Chapel and New Tampa editions of the Neighborhood News Magazine. Some learned of it from the signs posted at the intersection of Cross Creek and Morris Bridge Road and in front of the masjid. Overall, the visitors to the Open House enjoyed the event and felt comfortable enough to ask any questions they had. Alhamdulillah, they got answers that made them feel like Islam is a virtuous religion and that Muslims are truly courteous people. In addition, they were all visibly pleased with the inviting atmosphere and the helpful volunteers. Masha'Allah, the volunteers met multiple times during the weeks and days leading up to the Open House to coordinate the event; they wanted to ensure the most ideal setting for the visitors. Without their dedication, the event would not have been as pleasant and successful as it was. We look forward to continued bridge-building in the community and to another great Open House next year. On February 9, 2016, students in Grades 3 - 5 from AYA, Bayaan Academy & UAF represented their schools at the Hillsborough County STEM Fair at the Tampa Convention Center. Students entered projects in both the Group and Individual Competitions in such varied categories as Life Science, Physical Science, and Biological Science. Their projects showed their understanding of the scientific process and were very creative in both design and presentation. Masha'Allah, it was wonderful seeing them doing so well in the midst of students from almost every other private and public school in Hillsborough county. At the end of the day, we were fortunate to be able to get a picture with the students from all three Islamic schools. May Allah continue to guide them in their endeavors and make them leaders of the future. On February 26, 2016, the Gr. 5 and Gr. 7 students commemorated Black History Month by highlighting the achievements of African Americans throughout US history up until present day. Personalities such as Nat Turner, Fredrick Douglass, Michele Obama, Barack Obama, Malcolm X, Muhammad Ali, Ben Carson, Maya Angelou, Paul Robeson, George Washington Carver, Jackie Robinson and Michael Jordan were all recognized for their ability to positively contribute to their communities despite being poor and the racial prejudices they faced during their lifetimes. Students depicted their work in the forms of visual displays, ABC books, plays, poems and portraits. We learned amazing feats of greatness such as the story of Muhammad Ali, who was picked on as a child and couldn’t defend himself and had his bike stolen from him only to win an Olympic Gold Medal and later become the Heavy Weight Boxing Champion of the World. Muhammad Ali was born Cassius Clay and accepted Islam at the age of 33. We heard the story of Michele Obama, an intelligent, hard-working young lady, from very humble means, who went to Princeton University. While at Princeton, Michelle had a complaint filed against her by her roommate’s mother because she was black. Michelle went on to graduate not only from Princeton, with honors, but from Harvard Law School as well. She was also the first African American woman to become First Lady of the USA. We were told the story of Jackie Robinson who was the first African American to integrate major league baseball. Lastly we were told the life story of a man who lost his father at age 6, saw his mother placed in a mental institution before he was a teenager and was separated from his siblings after his family ward eventually went to jail. Years later, this same young man became one of the most dynamic voices for civil rights in America and an advocate for justice “By Any Means Necessary”. He visited more than 15 countries and met with their dignitaries. He even went on the pilgrimage to Mecca after accepting Islam. They learned the story of Malcolm X, El-Hajj Malik El-Shabazz, a life of transformation. Students learned lessons of courage and determination in the face of hardship. They learned the outcome of perseverance and hard-work. The students went away knowing that regardless of one’s past, one’s poverty, or one’s skin color, with courage and determination, there is a chance to achieve great things and leave a mark on society. In order to bring about changes, we may have to challenge the status quo. We live in a society that is very obsessed with instant gratification. From movies, to instantly downloadable books, to drive-throughs, and Amazon Prime shipping. It seems as though wanting everything right “now” keeps us all on our toes and makes us forget the importance of patience in our lives. If we can’t memorize the whole Quran in a year or a couple of months, why even attempt it? If it’ll take two more years to get a master’s degree, it’s a waste of time. If we have to invest a year in healthy eating and exercising before noticing any decreases in our body fat, then what’s the point? This kind of thinking has held us back for so long. But it doesn’t have to. What if we used instant gratification to our advantage? What if, instead of looking at everything we can’t have or do right now, we looked at everything we have and can do right now? For the past month, I made a calendar of goals that I have for each day, and I put check marks next to the days that I complete the task, and I leave the task’s box empty if I don’t complete it. I focused on small goals that I can do right now. Read Quran for 25 minutes every day. Recite the morning and afternoon adhkar. Read ten pages of the fiction book. You get the basic idea. Break down big goals into smaller goals and focus on them today. Right now. They will add up. Some days, I failed, but I woke up the next day, and tried again. And guess what? I’ve never been more successful accomplishing my goals than I have been this past month, alhamdulilah. I’m sharing this with you because I want you to know that no matter where you are in life, it’s never too late to be passionate about a goal and make small efforts to reach it. Even if you’re super busy like me, there is always a way to work in your goals to fit your circumstances. Want to recite Quran for 30 minutes a day but just don’t have the time to sit down for 30 minutes? Listen to Quran on a CD or MP3 player while you’re driving and recite with the shaykh. Want to recite the morning and evening adhkar, but don’t have time to memorize or read them? Then listen to them and recite with the shaykh while you’re on your way to work or coming back home from school. Want to do everything but don’t know how? Simple: don’t do everything. Do some things. Every day. Now. One day at a time. You’ll be amazed at what you can accomplish. This past Saturday, February 6, 2016, representatives from the New Tampa Muslim community visited Cypress Point Community Church and shared a Pot Luck dinner with members of the church. Cypress Point is Daarus Salaam Mosque’s neighbor to the south, and the visit and dinner were long overdue. Pastor Dean welcomed his Muslim neighbors, and Bilal Saleh, speaking on behalf of Daarus Salaam Mosque, said a few words about how the two communities could work together to alleviate the plights of the underprivileged and those in need before presenting Pastor Dean with a translated Qur’an and a gift of chocolates. Members of both congregations then served themselves and sat alongside each other and discussed topics of common interests: family, jobs, the Super Bowl and different projects they could collaborate on for the good of the community at large. iInsha’Allah, members of the Muslim community must continue to make sincere efforts to reach out to our non-Muslim neighbors. This is what Allah SWT and His Prophet SAWS commanded, and this is what will help off-set the negativity being spread on the political stage. “Mom, what is Qadr?” My almost eight-year-old daughter asked me. She was doing her Islamic school homework. I sat there thinking how history repeats itself. I used to ask my dad a similar question all the time. “Why do we have to do good things when Allah has chosen our destiny already Papa?” As a Pakistani, the concept of “Kismat” was drilled in my head. A predestined, preordained path. My daughter beckoned me again, and I told her Qadr meant “the will of Allah, or destiny”. Allah makes it very clear in the Quran that everything happens as Allah wishes it to be! However, that does not mean that we sit around and wait for miracles to occur. The Quran also goes on to explain that "Allah never changes the condition of a nation unless it changes what is in its heart.” (Surah al-Ra`d, 13:1). It is up to us to make our journey in this dunya to lead where our priorities take us. The Quran goes on to elaborate “We have shown man the right path. Now it is up to him to be grateful or thankless”. (Surah al-Dahr, 76:3). May Allah give us all the wisdom to follow HIS path and to lead a life that has the love of akhira as our highest priority! Ameen. Subhan'Allah, every time I write the date on notes I am taking or on a check I am writing, I am astounded by how quickly time is passing. I think to myself, and sometimes out loud, "How did it become February already?" Then, before you know it, it is March, and the school year is almost over. Then, before you know it, it is Ramadan. Wasn't it just Ramadan? Where did the time go? Subhan'Allah, in Surat-il-3Asr, Allah SWT swears by the waning day, or the passage of time. It is one of the shortest surahs in the Qur'an, yet it has so much meaning, and its implications on our lives are great. "If people just ponder over this surah, it is sufficient for them to get guidance for righteousness." "If nothing else but this would have been revealed and nothing else, then this was enough for guidance and righteousness." After swearing by the passage of time, or the waning day, Allah SWT makes His statement: Verily Mankind is in loss, EXCEPT those who have faith, and do righteous deeds, and enjoin themselves and others to be truthful and just, and enjoin themselves and others to be patient. We ask Allah SWT to make us of those who embody all four of these conditions, so that, no matter how fast time is passing, we will be of those who are not in loss. Subhan'Allah, each of us is "stamped" with an expiration date before the day we are born, but, unlike the expiration date on a carton of milk, we cannot see ours and have no idea when it will be. We remind ourselves and each other of this, not so that we will live in constant fear of this date and/or of death, but to remind ourselves NOT to put off for tomorrow, what we should be doing today. We ask Allah SWT to make us of those whose faith and deeds are worthy of His acceptance and of those who are deserving of His blessings and His mercy. Masha'Allah the Girl Scouts have been learning and having so much fun these past couple of months earning their badges, experiencing new things, and making friends. We have been learning about science and technology, so we went on a field trip to MOSI. The girls participated in many activities. The Cadettes used technology and made their own movie. The Juniors learned about coding and programmed items on the computer screen to move. They also learned about force and energy and built their own roller coasters. The Brownies learned about computers, using an online search engine and sending emails. The Daisies worked on the Earth Journey. They learned about how to be prepared for trip or a journey. They also learned about their feelings and how it's ok to express them the right way using good words. We went outside to collect nature things and sort them out in various ways. They learned about flowers, made foam flowers and learned how the flowers get nutrients by making flowers using straws. We ended it up with learning about our special skills ( good reader, good at cleaning up, helping each other...). We worked on a poster about helping to protect nature and the environment around us. The Brownies have been learning about countries all over the world including Italy, Russia, Palestine, and China. They are learning about the culture there and how each country is different regarding water conservation. The Juniors have been working on their Business Owner and Product Design Badges. We visited a local farm to see the products they sell and the type of marketing they use. Then the girls broke up into groups to design their own product, market it, and make a commercial. World Thinking Day is February 20th. We are working with the other Girl Scouts in our Council and will be presenting Egypt. The girls are really excited and made SWAPS (Special Whatchamacallits Affectionately Pinned Somewhere) to represent Egypt and exchange it with the other girls at the event. This will be an amazing opportunity to for Da'wah insha'Allah. If you would like to volunteer to make an Egyptian dish so that we can share it with the Girl Scouts at the event, please contact Sr. Manar. COOKIE SEASON IS HERE! Please support your Muslim Girl Scout Troop. The profit made will go towards activities planned for the rest of the year. The cookies are Thin Mints, Samoas, Tagalongs, Do-si-dos, Rah-Rah Raisins, Savannah Smiles, and Trefoils. They are $4 per box and we can deliver to you. Please email masarsour@yahoo.com with your order. When I was in Eleventh grade, I had an English teacher who changed the way that I looked at the world. This teacher taught me that writing is something that I should love. She taught me that the best way to learn is through application: continuous reading and writing. I had the honor of sharing this love that was instilled in me with many others at the Power of the Pen Workshop on January 22, 2016 at Daarus Salaam Mosque. I talked about how we often make writing much more complicated than it needs to be. Whether we realize it or not, we are all writers because we all experience life. We run, play, eat lunch, smile and help others. All of this encompasses our story that we tell through writing. Writing isn't a unique talent only in a few: it's in us all. If we're willing to delve deep into ourselves and our experiences and ask some hard questions, we might be shocked with the words that flow from our minds onto paper. All it takes is a book for inspiration and an idea. At the Power of the Pen workshop, I shared my own love for writing with so many people in one place, something I have never done in that way before. It was breathtaking for me to hear everyone participating and gaining something from what I had to say. In many ways, our lives are stories. I taught about how to write papers and give speeches, but these skills translate into telling our own stories as well. It's never too late to write our own stories better. Whether they're on paper, or they're our own actions in life. We all have a pen, and our mind is itching to churn out ideas. And Allah gave us all the ability to do so. On Sunday, January 17, 2016, the Tampa Bay Times included with its newspaper an insert titled “Pathways to Understanding”, an informative mini publication about Islam and Muslims. It is a treasure of unbiased and factual information on most facets of Islam and a Muslim’s life. Growing Islamophobia and general false publicity about Islam in the United States and Europe has been creating dangerous intolerance and unfounded hostility against Muslims and Islam. This can lead to discrimination against Muslims in all phases of their life – employment, housing, education, social interactions, etc. Alarmed by this, and a desire to create more tolerant, humane and progressive society, Sue Bedry of Tampa Bay Times Newspaper in Education program conceptualized “Pathways to Understanding”. The objective was to counter the misinformation and to replace it with accurate and unbiased facts. This, she hoped, would promote a better understanding of Islam and Muslims and would create greater harmony between all members of the society. The vehicle to achieve this objective was to publish an educational Newspaper insert, to be published in the Newspaper and distributed in most local schools. Doris Duke Charitable Foundation and the Doris Duke Foundation for Islamic Art’s Building Bridges program agreed to fund this project. Community Tampa Bay, whose vision is to end all forms of discrimination by cultivating inclusive leadership through dialogue and cross-culture interactions, joined hands with The Tampa Bay Times to assist in the project. Sue Bedry conducted most of the research and writing for ‘Pathways to Understanding’. She did an excellent job – her commitment to choosing the most pertinent subjects, conducting accurate and thorough research and her ability to present them in the most compelling and delightful manner deserve tremendous praise. An advisory committee also guided the ‘Pathways to Understanding’ publication. The Advisory Committee members included Jennifer Russell, Sarh Ogdie and Kaukeb Malik fromCommunity Tampa Bay as well as a number of community brothers and sisters includingImam Jihad Brown and Hassan Shibly of CAIR. This insert can also serve as a tool of Dawah. You can obtain additional, free copies of ‘Pathways to Understanding’ and distribute them to your neighbors, co-workers and friends. Click here to download a pdf version of the insert. or call 800-333-7505 ext. 8138. Congratulations to Sarah Elbasheer whose painting was selected for exhibition in the 2016 Biennial Southeastern Regional High School Artists Competition at Birmingham-Southern College. This visual arts competition is hosted by the Art & Art History Department and Admissions Office, and it recognizes talented rising artists in the Southeastern United States. Her art piece will be displayed from January 10th through January 28th. Sarah is a 10th-grader at American Youth Academy (AYA). Shamaa Siddiqui is another local high school student who has great potential as an artist, masha'Allah. Shamaa is a Senior at Tampa Bay Technical School; she is enrolled in the Health Sciences program. Congratulations to Awwab Azam on publishing his first book. Awwab wrote the book during the summer between 1st- and 2nd-grade as a project in Ahlul Qur'an. 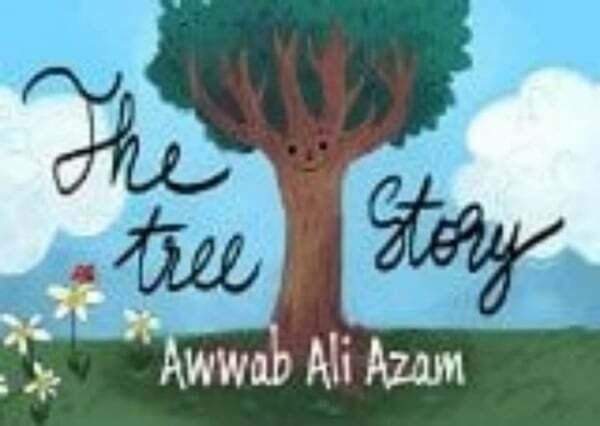 His book, The Tree Story, is available for purchase on Amazon.com. Awwab is a 4th-grader at Bayaan Academy Homeschool Co-Op. May Allah protect and guide all of our youth and bless them with all that is good is this life and the next. Growing up, my parents always taught me how to make decisions for myself, and they gave me a sense of autonomy that I am forever grateful for. They taught me how to value their opinion and advice by listening to me no matter what I was facing in life. It is because of the interdependence that they instilled in me that I am able to have an inner compass of right and wrong, and stay away from things that might hurt me, alhamdulillah. Why does this matter? It matters because setting boundaries for children is important, but it is also important to teach them how to make the right choices on their own. It is equally important to gain the trust of children so that when you are in a position to give them advice, they will take it seriously. I really believe that one of the reasons why our ummah is not united is because families are so divided. A place that should be seen as a refuge is often seen as a dreadful prison by a lot of the youth. A couple of days ago, my younger brother bought two boxes of pizza with money that my grandfather had given him. My mother, who is a healthy eating advocate, did not approve of my brother’s purchase. She did not want my brother to eat the pizza--which was filled with artificial ingredients and void of nutrients. My mother told my brother that if he wanted to eat the pizza, that it would be no issue, but that he would have to face real world consequences for his actions. She pulled out her nursing book and showed him pictures of people with preventable diseases that can result from obesity related to overeating. Foods that are void of nutrients and are high in sugar, salt, and fat, are made to make us addicted to them. It’s no wonder that it’s easy to eat three slices of pizza and difficult for us to eat a bowl of baked broccoli. I started laughing, because I was almost positive that he would respond that way. I was born 24 years ago and have been around my mom for a long time, so I knew her ways. What does this story teach us? It teaches us that my brother really valued my mother’s opinion. I know for a fact that my brother and mother are close to each other, and whenever he has any problem in life, she sits and listens to him, regardless of what it is. What else does it teach us? It teaches us that truly guiding our children should involve showing them how to make their own choices, where appropriate. If children feel like they can’t be interdependent, that they can’t trust your opinions or make their own choices, then they probably will be the first person to break all the rules the moment they get the chance. This is what we’re trying to avoid. The last thing a young child, hormonal teenager, or a “set-in-their-ways-adult” needs is full reign to break all the rules that could very likely hurt them emotionally and physically--but they’re too blind to see that, if they are unwilling to value and appreciate their parents’ advice. Undoubtedly, no family will ever be perfect, even with the best parenting methods. We are all human and susceptible to mistakes and shortcomings. But if we can do better, then we should try to do better. There are always other ways to phrase pieces of advice or choices that can allow children to feel more included in factors that deeply impact their lives. If we don’t make them feel loved and included, then who will? What kind of influences do we want shaping our children? One of our duties towards our neighbors is to visit them, check on them, help them, be there when and where they need our help and wish them well. You cannot go to sleep knowing that your next door neighbor is hungry. Our beloved Prophet Mohamed Peace Be Upon Him ( PBUH) has repeatedly recommended to take care of neighbors to the point that the companions of Prophet Mohamed( PBUH) thought the neighbors will inherit from them. Putting these teachings into action locally, the Dawaa Committee at ISONET ( Islamic Society of New Tampa) has been reaching out to the neighbors to wish them well. We also explain that, although Muslims do NOT celebrate Christmas, Muslims DO celebrate the message of JESUS, who is loved by Muslims as a Prophet of God, and who is mentioned in the Holy Quran 25 times more than the Prophet Mohamed (only mentioned 5 times). We also point out that the Virgin Mary is the most honored woman on earth, and that a whole chapter in the Holy Quran was named after Her. She is considered to be a role model and yes, she was wearing a (Hijab) or a head scarf, which is symbolic of purity and modesty and which is also worn by Muslim women and adult girls. What we do is a public relations' (PR) campaign especially at a time with rising wave of Islamophobia and with the recent events in Paris and San Bernardino. We have been doing these visits for years, but felt it was even more important as anxiety was at its peak, and everyone was curious to know what Islam and Muslims are all about. A simple way to achieve that and change the narrative is we visit, talk, laugh, share something sweet and agree on working together on making our community better and our country safe. As an aside: When it comes to media-bashing, you will be pleased to learn that almost every group that came before Muslims as the new kids on the block, had their fair share of being bashed and called names! The Catholic Deacon explained that the same type of media-bashing happened to Catholics 100 years ago; they were not even considered to be Christians, were treated very badly, and were discriminated against when applying for jobs. So, for two consecutive Sundays, following Fajr Prayer and joining the Free Community Breakfast which is open for Muslims and non-Muslims interested to in learning about Islam, brothers and followed by QuranClass and with a group of committed volunteers, we visited Cyprus Point Community Church, our next door neighbors, and had a very warm welcome; they even offered helpon securing our borders for the safety of our community! We then visited Heritage Church, a small church but one which is deeply rooted - as a 5th-generation Floridian explained- and then went on to visit the nearby Sikh Temple. At both places of worship, all of us shared the word of peace. The following Sunday, we followed the same routine: Fajr Prayer, then free community breakfast , then Quran class, and then went to visit St. Mark Evangelist Catholic Church on Cross Creek Blvd. We were met by a very welcoming staff, and we dropped off sweets. It was perfect timing: hungry worshipers had just finished their service and were walking into the hall; we wished them well, and the leadership there welcomed cooperation on educational efforts to clear the misconceptions about Islam presented by the media. After visiting the church, we went across the street to visit the fire station as the crew was just finishing breakfast. We had great time with the staff and agreed on a common enemy: ignorance. We agreed that education and kindness are the main ingredients to the curefor Islamophobia. Islamophobia is hurting everybody eventually, as we are all Americans, and we have to work together for the betterment of all of our community. The same was echoed at the second fire station, and everyone left with a new chapter being written in building bridges of trust and respect with their fellow Americans of Muslim faith living in the same community. Everyone is encouraged to replicate this work wherever they happen be to show that Muslims do care about their neighbors and are fulfillingthe teachings of our Beloved Prophet Mohamed (PBUH), who was sent as a mercy to all mankind. In this way, we can change the negative media notion that Muslims hate America and do not care about their community and country. Our action speaks volumes!